Attention all Transitioning Military, Veterans, Dependents, and Veteran Supporters! Our next three LinkedIN Job Search Workshops for transitioning active duty personnel & their families on MacDill Air Force Base in Tampa are scheduled for April 19th, May 17th, and June 14th (all are Fridays). Space is limited and pre-registration is required — please call the MacDill AFB Airman & Family Readiness Center at (813) 828-0145 to register. (PHOTO) Our workshops are energizing, highly practical, and fun! USAF veteran Jonathan Pudas celebrates as his professional LinkedIN network reaches the important 500+ milestone right before his eyes! 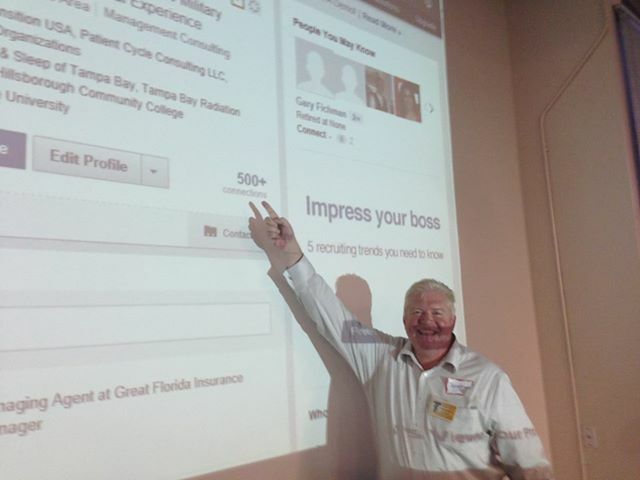 Our first LinkedIN Job Search Workshop on a military base was held on Nov. 16, 2012 at MacDill AFB in Tampa as an optional addition to their Transition Assistance Program (TAPS). This was the first ever in-depth LinkedIN Job Search Workshop held on a U.S. military base anywhere in the world, and we continue to work towards making this training available to ALL transitioning U.S. military nationwide! Please join us in this life-changing mission by making a donation via our “Donate” button today! Contact Nancy Laine here to learn more.